This outdoor speaker is a must for your next gathering. The water-resistant housing protects against damaging conditions, and the PowerPort bass venting delivers smooth, shaking lows to help get your party in gear. Dual tweeter array allows use as a single stereo loudspeaker or a L/R speaker when paired (additional speaker sold separately). Dual voice coil, Dynamic Balance®, aerated polypropylene cone with rubber surround offers high-performance power handling and efficiency. PowerPort bass venting adds deep, booming bass. All-weather certified for water resistance and strength in inclement weather. Single/Dual input switch and dual tweeter array that lets you work the speaker as a single high/performance stereo loudspeaker, or L/R speaker in a high performance stereo pair. 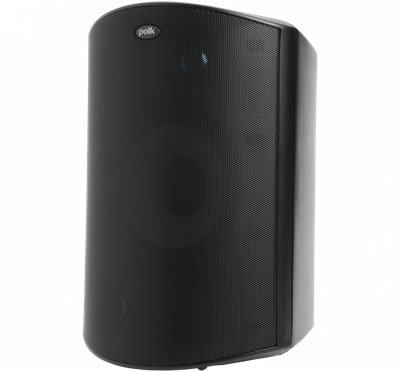 It’s time to get that indoor sound you love - all from an outdoor loudspeaker you can put anywhere around your home. This patented technology analyzes the speaker’s entire electro-acoustic and mechanical system for improved material selection and more efficient geometry. Built to withstand the worst elements—salt-fog, UV, extreme temps or heavy rains, you name it. Aluminum grilles and bracket, with stainless steel and brass hardware means no rust—ever.